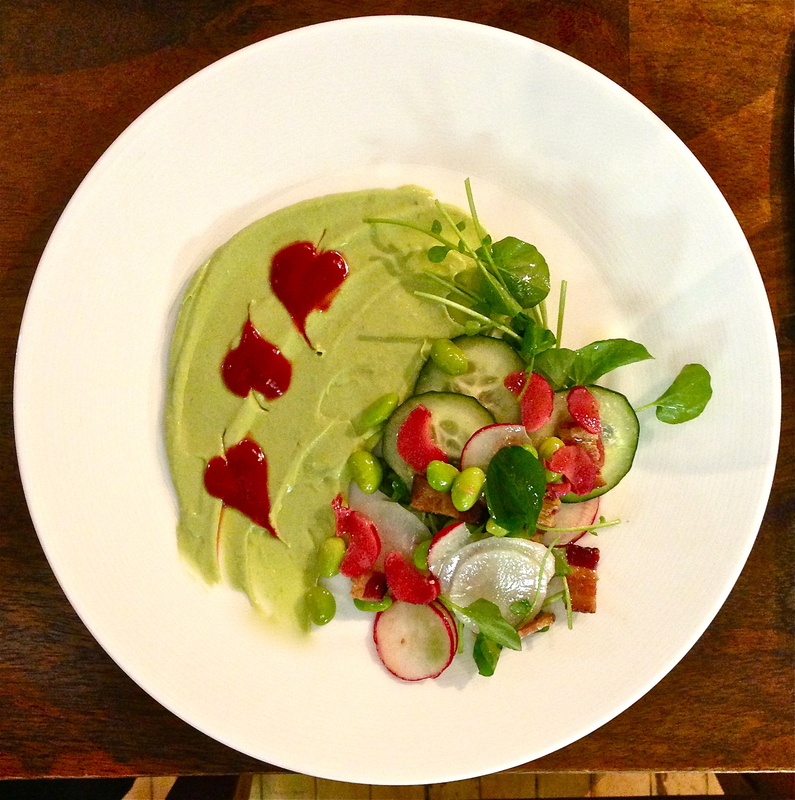 Watercress salad with cucumber, daikon, radish, edamame, pickled rhubarb, bacon, and a sherry vinaigrette, with avocado cream and tomato-rhubard hearts. 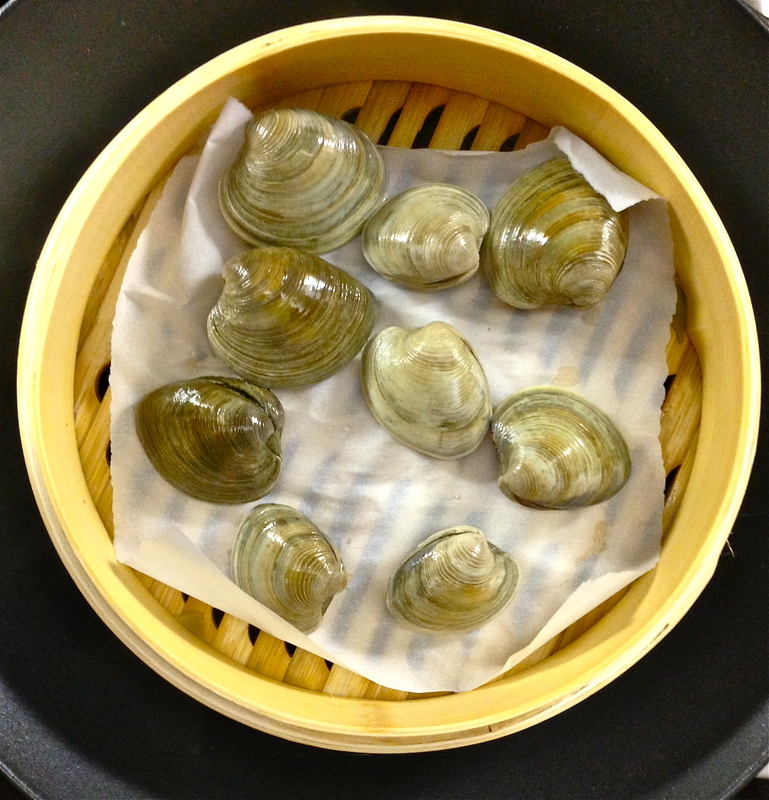 The idea is to blend the two sides while eating to create balance between acidity and richness. Valentine’s can be an awkward day to be a poet. It shouldn’t be. It should be a day of gratitude since it is one of the main times when the culture comes looking for poets, seeking out those lapidary phrases to commemorate important sentiments. Poets have been insecure about this role for what seems like always, but definitely English-language poetry has been afflicted since the beginning. Just consider Sir Philip Sidney’s defensive blast against poetry’s haters in his sixteenth-century Defence of Poësy: “yet thus much curse I must send you in the behalf of all poets, that while you live, you live in love, and never get favour, for lacking skill of a sonnet, and when you die, your memory die from the earth, for want of an epitaph.” There’s something revealing in the overselling of his poetic returns, and I’m sure if Sidney produced on demand as an inscription for a Valentine’s Day card his sonnet 31 (“With how sad steps, O Moon, thou climb’st the skies!”) or sonnet 45 (“Stella oft sees the very face of woe”), which are two of my favorites from his Astrophil and Stella sequence, there would be a severe case of buyer’s remorse. The problem is those sonnets aren’t really occasional verses. Occasional verse is good for weddings and graduations and inaugurations and Valentine’s Day cards, because in each of those instances the event is more important than the words. They’re times of action, not reflection. They require expressions that are unequivocal and un-conflicted. If you have to clear your throat while giving a wedding toast, you’re kind of a jerk. Just say something nice, and sit back down so the good time can keep on going. That’s what everyone is there for. I can’t think of a good love poem that doesn’t clear its throat in some way. And that’s a good thing. One of my go to love poems is William Meredith’s “Crossing Over,” a poem full of honest doubt and an honest insistence on affection despite it all, with a nod toward a larger historical-social milieu to put that affection into perspective for good measure. I have actually read this poem at weddings, but I imagine everyone just pretending not to hear the complicated parts. I finally have a steamer again! 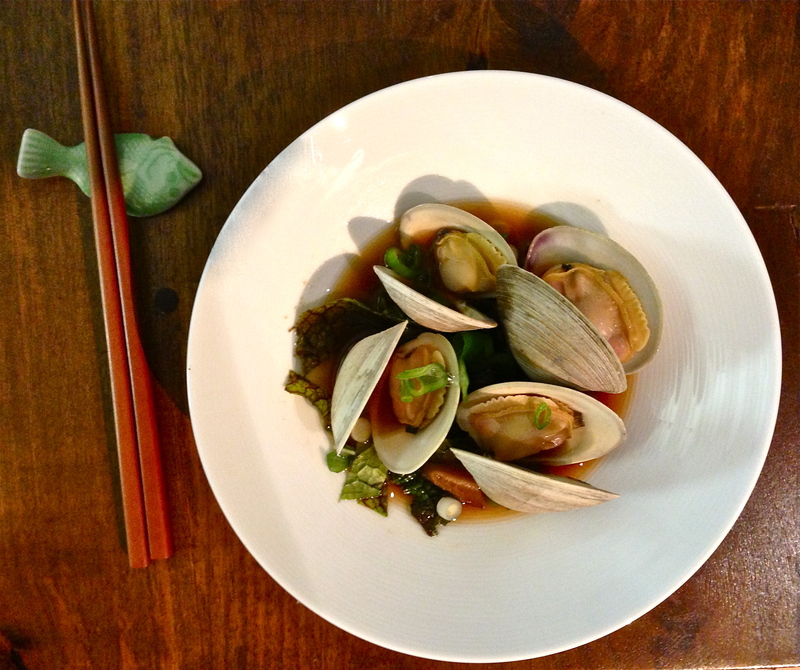 Littleneck clams with red miso broth, mustard greens, peas, and scallions. The broth is kombu, dried shiitakes, water, mirin, soy sauce, and red miso paste. Where poetry has failed me for occasions needing commemoration (birthdays, anniversaries, holidays), cooking has served just fine. It has provided the right amount of ritual and ceremony to acknowledge the importance and has expressed sentiment unambiguously. And it’s a gesture I can believe in (unlike a bad poem) or don’t have to practice selective attention to enjoy. Through trial and error, I’ve learned to streamline the menus for these celebratory meals. After all, you need to be sharing in the moment, not just cooking in the background. One way I’ve done this is by planning dishes I can prep in advance and that I can finish cooking and assemble quickly. 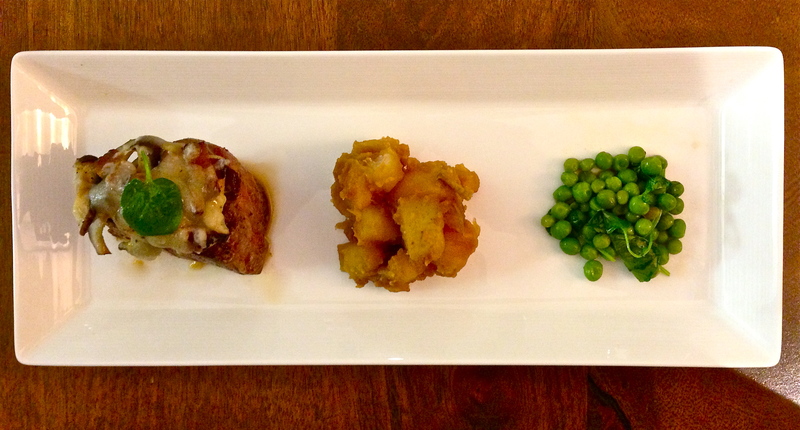 Beef filet topped with bacon, shiitakes, and pecorino; red miso glazed potatoes; and peas with watercress. I pan-seared the filets and then finished them in the oven with the topping. The shiitakes are from the miso broth. While the filets were resting after cooking, I added the peas and watercress to the hot pan, along with a dash of chicken stock, scooping up the pan juices while not turning the peas to mush. The potatoes are Yukon Golds, and the glaze is miso paste and amber agave syrup. Valentine’s Day this year, I also decided to let certain ingredients appear across the meal to give it a sense of transformation and cohesion. I knew I wanted to do something that would be striking visually, and I got into my head an image of hearts, like what might come with a reduction on a dessert. It’s a little cheesy and gimmicky, but that is the spirit of the day, no? That thinking led me to rhubarb. I diced some of the rhubarb and added sugar, a little water, and some cherry tomatoes that were halved and marinated with balsamic vinegar, olive oil, a chopped garlic clove, and salt and pepper. I broke all of that down on the stove and then blended it with a hand blender. The hearts would be created by making a sphere and then running a toothpick from one edge straight through and out the opposite side. I needed a base to hold and contrast these hearts, so I decided on the avocado cream, which is just a ripe avocado, a pinch of kosher salt, and a dollop of sour cream to smooth it out. The hand blender was used for this as well. I also quickly pickled some of the rhubarb with sugar, kosher salt, and a splash of rice wine vinegar. Dessert was ice cream with homemade chocolate chip and walnut cookies with pink sea salt. No decent pictures came out, but that’s okay. I can only take partial credit for the dessert. This entry was posted on February 22, 2013 by Paul Otremba. It was filed under Cooking Life, Writing Life and was tagged with Beef, Food, Holiday Menu, Littleneck Clams, Poetry, Recipe, Salad.